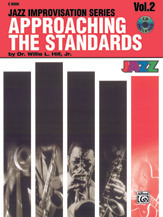 Approaching the Standards, Volume 1 (Book & CD), E-flat Instruments (E-flat Instruments), Jazz, #YL00-SBM00003CD By Dr. Willie L. Hill, Jr.
For the 'fearful to the fearless,' Approaching the Standards is an innovative, user-friendly approach to jazz improvisation. 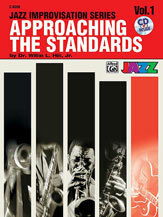 Designed for the individual or group, each of the three volumes of this play-along CD contains eight classic jazz tunes. Each volume features a jazz group demo recorded by top pros in a jazz gig setting, clearly written musical examples, jazz vocabulary, transcription opportunities, informative composer insight, and a useful discography. Everything you need to begin improvising or to improve your jazz skills is included in Volumes 1, 2, and 3, available for C, B-Flat, E-Flat, and Bass Clef instruments. Volume 1 includes: Billie's Bounce * On the Trail * Cantaloupe Island * The Preacher * Summertime * Satin Doll * C Jam Blues * I Got Rhythm. 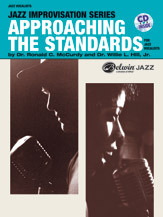 Approaching the Standards for Jazz Vocalists (Book & CD) (Voice); Jazz; #YL00-SBM00034CD By Dr. Willie L. Hill; Jr. 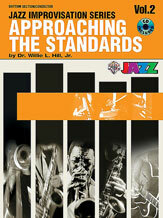 Approaching the Standards; Volume 1 (Book & CD); C Instruments (C Instruments); Jazz; #YL00-SBM00001CD By Dr. Willie L. Hill; Jr. 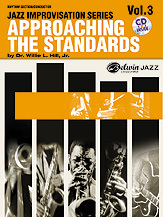 Approaching the Standards; Volume 1 (Book & CD); B-flat Instruments (B-flat Instruments); Jazz; #YL00-SBM00002CD By Dr. Willie L. Hill; Jr. 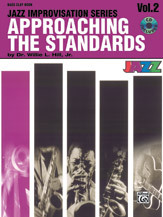 Approaching the Standards; Volume 1 (Book & CD); Bass Clef Instruments (Bass Clef Instruments); Jazz; #YL00-SBM00004CD By Dr. Willie L. Hill; Jr. Approaching the Standards; Volume 1 (Book & CD); Rhythm Section/Conductor; Jazz; #YL00-SBM00031CD By Dr. Willie L. Hill; Jr. Approaching the Standards; Volume 2 (Book & CD); C Instruments (C Instruments); Jazz; #YL00-SBM00005CD By Dr. Willie L. Hill; Jr. 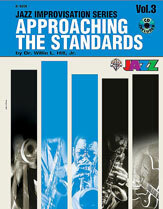 Approaching the Standards; Volume 2 (Book & CD); B-flat Instruments (B-flat Instruments); Jazz; #YL00-SBM00006CD By Dr. Willie L. Hill; Jr. 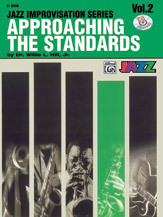 Approaching the Standards; Volume 2 (Book & CD); E-flat Instruments (E-flat Instruments); Jazz; #YL00-SBM00007CD By Dr. Willie L. Hill; Jr. 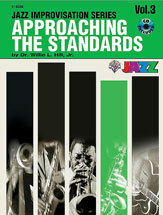 Approaching the Standards; Volume 2 (Book & CD); Bass Clef Instruments (Bass Clef Instruments); Jazz; #YL00-SBM00008CD By Dr. Willie L. Hill; Jr. Approaching the Standards; Volume 2 (Book & CD); Rhythm Section/Conductor; Jazz; #YL00-SBM00032CD By Dr. Willie L. Hill; Jr. 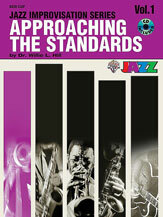 Approaching the Standards; Volume 3 (Book & CD); C Instruments (C Instruments); Jazz; #YL00-SBM00009CD By Dr. Willie L. Hill; Jr. 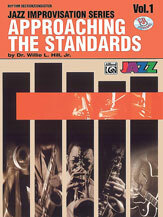 Approaching the Standards; Volume 3 (Book & CD); B-flat Instruments (B-flat Instruments); Jazz; #YL00-SBM00010CD By Dr. Willie L. Hill; Jr. 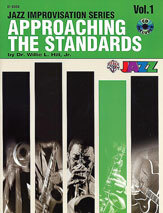 Approaching the Standards; Volume 3 (Book & CD); E-flat Instruments (E-flat Instruments); Jazz; #YL00-SBM00011CD By Dr. Willie L. Hill; Jr. Approaching the Standards; Volume 3 (Book & CD); Bass Clef Instruments (Bass Clef Instruments); Jazz; #YL00-SBM00012CD By Dr. Willie L. Hill; Jr. Approaching the Standards; Volume 3 (Book & CD); Rhythm Section/Conductor; Jazz; #YL00-SBM00033CD By Dr. Willie L. Hill; Jr.